Dhaka, 6 Mar, Abnews: Prime Minister Sheikh Hasina today laid importance on mechanization of whole jute sector asking the public sector industries to work sincerely to make the jute mills sustainable. She said the government has taken steps for modernization of jute cultivation, procurement and preservation aimed at attracting more farmers and traders to this highly potential sector. Sheikh Hasina said five jute mills were reopened by giving facilities mostly to the private sector and expressed the hope that the public sector mills would do their jobs with sincerity and honesty to save the mills and increase production. The prime minister was inaugurating three-day programme of National Jute Day and Diversified Jute Fair 2018 at Bangabandhu International Conference Centre (BICC) here. The prime minister identified the old and obsolete machineries as the main obstacles to making the public sector jute mills fully operational saying new machineries should be procured for modernization of the production system. She assured of giving all possible support from her government in this regard. Minister for Textiles and Jute Md. Emaz Uddin Pramanik presided over the function while State Minister Mirza Azam and chairman of the Parliamentary Standing Committee on Ministry of Textiles and Jute Saber Hossain Chowdhury were present as special guests. Secretary of the ministry Md. Faizur Rahman Chowdhury gave the welcome address. The National Jute Day is being observed for the 2nd time in the country for promotion of the jute sector with participation of all concerned linked to jute cultivation, production of jute goods, marketing and users and researchers. The prime minister distributed prizes among the students who secured the first, second and third position in the essay writing competition of school students on the National Jute Day. She also distributed awards among 12 best jute growers and jute traders in 11 categories. The prime minister said jute is one of the valuable assets of Bangladesh as well as a diversified exportable goods having huge potentiality. So, we have to work together to exploit the prospect, she added. Sheikh Hasina said the government has paid outstanding dues and loans of the public sector jute mills to the tune of about Taka 3,000 crore to facilitate the mills to resume their production. "Now, it's the responsibility of the officials who are in charge of the mills as well as the workers and employees to make the mills sustainable," she said. Everybody would discharge their duties effectively to keep the mills operational, she hoped. 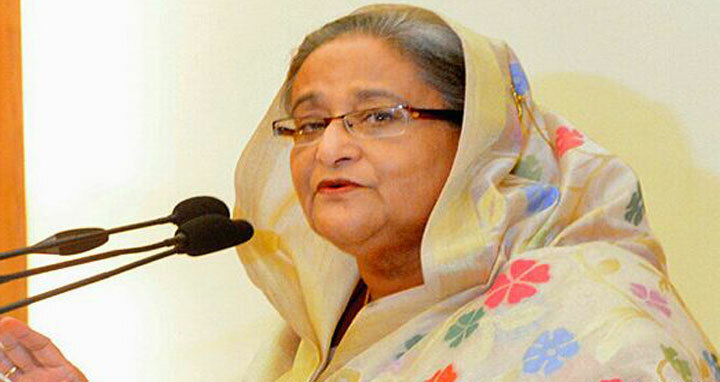 Sheikh Hasina said the jute market is a booming one across the world. Export of jute and jute products has boost up in recent years. Our market would be more prospective if we can produce modern products, she said. The prime minister said the government has enacted a law making the use of jute packaging compulsory for all products. The law has contributed to creating demand for jute products in the country, she said. The prime minister said jute plays an important role in our economy and protection of environment. Jute is an inevitable part of our culture and heritage. National Jute Day has been declared to expedite the economic development by exploring the potential of Golden Fibre Jute of Bangladesh, she said. Bangladesh produces the best quality of jute in the world and is the 2nd largest jute producing and first in exporting raw jute in the world. The jute sector still has enormous economic potentiality, she said. Recalling her childhood memories, the prime minister said it is needed to make the children aware, especially the students, about the prospect and possibility of jute. She hoped that teachers and guardians would play a due role in acquainting the future generation with our own heritage and culture. Sheikh Hasina said jute was not given a proper attention due to lack of farsightedness by the post-1975 regimes of Bangladesh. The BNP government had orchestrated a deep conspiracy to destroy the jute sector, she said. He said after coming to power in 1991, the BNP government made a deal with the World Bank to close all jute mills in Bangladesh terming those as losing concerns and the deal resulted in suspension of export of 2.5 lakh bale of jute from Bangladesh to different countries. At the same time the WB signed agreement to import jute from India and rejuvenate their sick jute mills," she said.